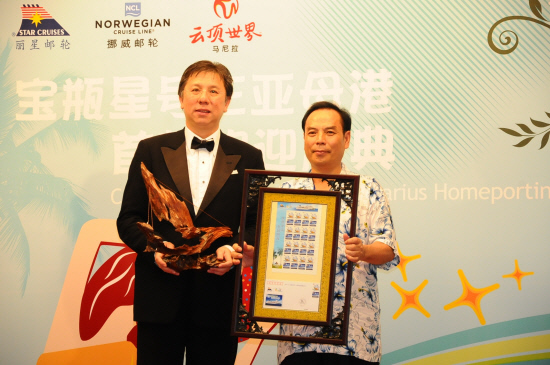 Chua (left) and Chen Haibo, deputy director of the standing committee of Hainan Provincial People’s Congress, exchange souvenirs at the ceremony to welcome the SuperStar Aquarius to Sanya. Star Cruises became the first international cruise line to homeport in Sanya, Hainan when its 13-deck SuperStar Aquarius arrived at the port last Thursday amidst Chinese traditional revelry and festivity. The leading cruise line operator in the Asia-Pacific held a ceremony at Sanya Phoenix Island International Cruise Terminal to celebrate the 51,309-tonnage SuperStar Aquarius homeporting in Sanya with new Sanya-Vietnam cruise itineraries. In a press release, Star Cruises said it is the pioneer of cruise holidays in China and the Asia-Pacific, and will continue to play a vital role in developing the industry in mainland China. Star Cruises president David Chua, who led the management team to welcome the vessel, said: "We have started promoting the Sanya-Vietnam itineraries regionally and internationally more than six months ago. Today, we invited over 500 representatives from international and Chinese travel agencies and media organisations to celebrate the launch. "The new deployment reflects Star Cruises’ long-held mission in developing new and interesting cruise holiday products for customers. During the five-month deployment, SuperStar Aquarius will ply the South China Sea, departing from thriving Sanya in two- and three-night destination cruises to Halong Bay, Danang and Hue. "The new cruises will take advantage of the cool and sunny weather in Sanya, coupled with duty-free shopping, sightseeing, entertainment and cultural shore excursion options which the four ports are famous for." Star Cruises said passengers of SuperStar Aquarius will experience China’s most popular beach paradise and its pristine fine-sand long beaches. Sanya has attracted increasing tourist attention due to its duty-free shopping, mushrooming tourist attractions and MICE facilities. For Vietnam, Halong Bay features limestone karsts and many islands along the Bai Chay Beach while Hue, an Unesco World Heritage site, boasts the Nguyen Dynasty imperial citadel, the Tombs of the Emperors and the Thiên Mu Pagoda, while Danang offers the opportunity to experience the historical Hoi An town and the country’s fifth World Heritage site My Son, the scenic Non Nuoc beach and the bustling city life. SuperStar Aquarius offers 765 cabins with 1,529 lower berths. Its facilities include nine restaurants and bars offering international cuisines; karaoke, basketball court, golf driving range and outdoor jacuzzi.